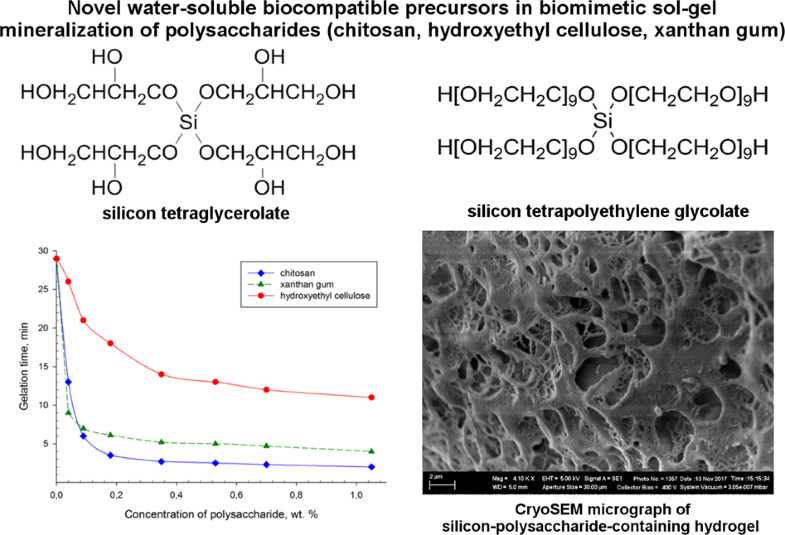 We have demonstrated that our patented water-soluble biocompatible polyolate precursors of silicon tetraglycerolate and silicon tetrapolyethylene glycolate can be successfully utilized in biomimetical mineralization of polysaccharides of different nature. By the example of chitosan (cationic), xanthan gum (anionic), and hydroxyethyl cellulose (uncharged) polysaccharides, an accelerating effect on the gelation process has been demonstrated, and a stabilizing effect has been revealed on the hydrogels formed as transparent monoliths showing resistance to syneresis. Structural features of silicon–polysaccharide-containing hydrogels were investigated using advanced physical methods of cryo-scanning electron microscopy and transmission electron microscopy. Thus formed silicon-containing 3D network of gels is found to be polymeric and appears to have an ordered amorphous morphostructure, which can be explained as caused by the effect of polysaccharides serving as templates. The difference in the reactivity of precursors leads to the peculiarities of the gelation process in the presence of the polysaccharides under study, as well as to the difference in the composition of the formed products. 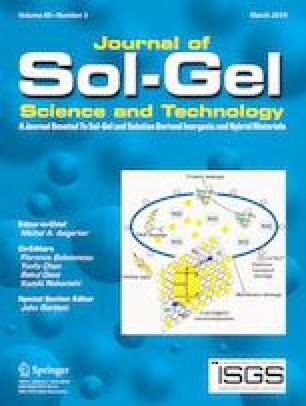 The sol-gel process utilized to obtain the silicon–polysaccharide-containing hydrogels proceeds under the mild conditions with no catalyst or any organic solvent, and thus can be regarded as belonging to the green chemistry methods that show promise for biomedical material applications. Silicon tetraglycerolate and tetrapolyethylene glycolate are promising precursors in sol-gel process. The precursors were successfully used for biomimetic mineralization of polysaccharides. Polysaccharides accelerate the gelation, stabilize hydrogels formed, and order their morphostructure. Polymeric network of gels contains polyolate bridges between silicon atoms. 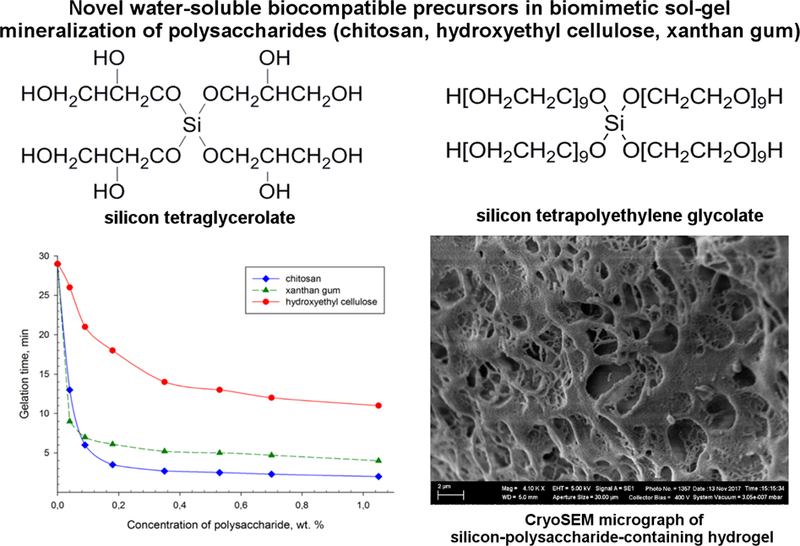 Silicon–polysaccharide-containing polyolate hydrogels are promising for biomedical purposes. We are grateful to Natasha Pomortseva for help in translating the paper. The equipment of the Ural Center for Shared Use “Modern Nanotechnology” and Laboratory of Structural Methods of Analysis and Properties of Materials and Nanomaterials of the Ural Federal University was used. This work was carried out in the framework of the state assignment of Russia (theme no. АААА-А19-119011790134-1).